Like so many film tie-ins this platformer looks somewhat un-remarkable. But behind the beautiful graphics is there more to this game? CES 1993 was not an entirely rosy experience for Capcom. Everyone may have been impressed with ‘Mega Man X’ and pleased with the direction they were taking the ‘Street Fighter’ series, but behind closed doors, there was a storm brewing. For several years the company had secured the rights to exclusively release adaptations of Disney properties on Nintendo consoles. During a nineties animation renaissance, it was a license to print money. There was a problem though. This access to Disney did not extend to the Sega consoles that had found huge popularity in America. To make things worse, Virgin had swooped in on the licensing rights to the newest Disney film ‘Aladdin’. 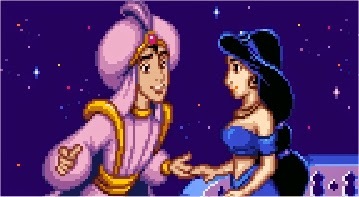 The race was on to produce an 'Aladdin' game for the 16 bit console; Capcom making a Snes version and Virgin making a tie-in game for the Mega Drive. To make things more exciting, both games had to be in the shops before the ‘Aladdin’ home video release. After seeing Virgin’s Mega Drive version of ‘Aladdin’ running at the Chicago CES show, it’s rumoured that Capcom knew they had the inferior product. With Disney involved in the character art and animation, the Sega iteration looked incredible. Its central character was graceful and the environments were beautiful. It was clear that Mega Drive Alad-did what Snes Alad-didn't . Defeated and intimidated, Capcom suits demanded better animation, the release date however was not extended. The production team were literally told to up their game. Understandably, the development team remain bitter to this day. Veteran game developer Shinji Mikami served as a designer on the Snes version. Looking back he admitted he has a preference for Sega's 'Aladdin'. "If I didn't actually make [the SNES game], I would probably buy the [Mega Drive] one," Mikami told Polygon. "Animation-wise, I think the [Mega Drive] version is better. The [Mega Drive] version had a sword, actually. I wanted to have a sword." 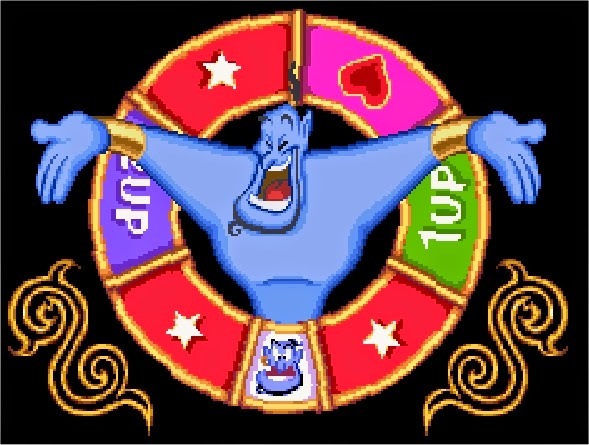 With two different versions of 'Aladdin' on the two rival 16 bit machines, the game was (and remains) an obvious way of judging Nintendo and Sega against one another. 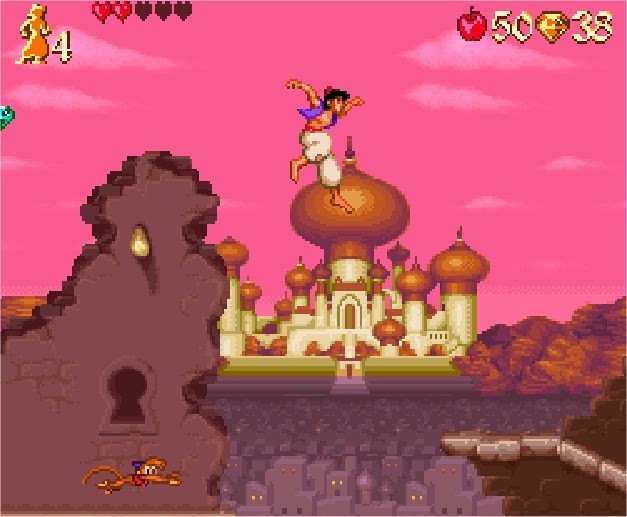 However, while the Snes version was reworked to mimic the look of the Mega Drive and both games are 2D platformers, the two adaptations of ‘Aladdin’ actually prove very different when placed against each other. Mega Drive owners had a slightly generic hack and slash action game. For the Super Nintendo though, Capcom stuck closer to the source material. The levels are obviously designed with the intent of using all of Aladdin’s street rat skills. As you effortlessly jump from pole to pole and from enemy to enemy there is a feeling that you are playing a parkour game, closer to ‘Prince of Persia’ than anything else. The game feels fluid and mastery of the acrobatics feels like a skill in itself. The Mega Drive game was undeniably prettier, may have had a sword, but the SNES game is the more creative and surprising. With a level design that values pin point accuracy in landing, you would imagine a lot of trial and error needs to be invested. However the introduction of a slow landing mechanic and levels design for speed, progression feels intuitive. In fact, to best experience the game you should rush through it. 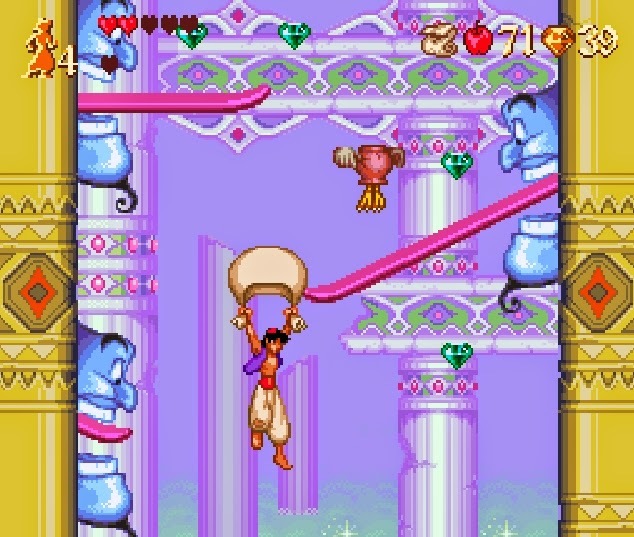 Inching through a stage makes the game feel repetitive, but stringing jumps together and exploiting Aladdin’s skills makes the adventure thrilling. However, playing at speed really does exacerbate the game’s greatest non-visual shortcoming; its ridiculously short length. “In many ways the problem with ‘Aladdin’ is integral to the licence" Edga Magazine noted. "It has to be geared to satisfy the casual player first.” To make a game that is playable by as many people as possible the experience inevitably because way too easy for those used to gaming. With copious amounts of lives, easy bosses, and short levels the only challenge in the whole game is a rug escape level. Even this is simply a matter of memorizing the best route through a stage. In fact, I defeated the final boss on my first ever play-through, with 5 continues and 9 lives remaining. For those who want a greater challenge there are red gems scattered around the levels. These (beyond giving you yet more lives) also serve as a method of unlocking an alternative ending. Getting all 70 demand some creative thinking and mastery of the controls, but its a case of the experience being its own reward. The alternative ending equates to nothing more than a credit roll with a different background, which hardly seems worth the effort. 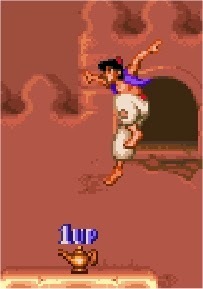 Much like the visuals, the soundtrack of the Snes’ ‘Aladdin’ does pale in comparison to the Sega competition. One level echoes Capcom’s ‘Ghouls and Ghosts’, while others are either poor renditions of the film’s score or original music that repeats far too often. It seems somewhat lazy of Capcom considering that the Super Nintendo with its superior sound chipset should always come out on top over the Mega Drive. To make this audible worse, what few sound effects there are in the game feel lifted from games such as ‘Mickey’s Magical Quest’ and add little to the experience. As so often proves to be the case, Super Play Magazine was spot on in their final thoughts. Enjoyment of ‘Aladdin’ really does depend on what you wish to get out of it. “A short intense burst of gaming heaven or something you’re still going to be playing a week later.” What’s here is enjoyable, inventive, varied and attractive when judged on its own merit rather than compared against the Mega Drive equivalent. Indeed, the general consensus that Sega had the better game is somewhat distort by the superior aesthetic and music. According to Retro Gamer Magazine, Virgin developed the Mega Drive game in just 90 days and as such what the player does throughout the longer game is more repetitive, with levels more uniform. There are no levels devoted to riding carpets if you console of choice has a Sega logo. Also at no point are you tasked with climbing a ladder made out of Genie’s tongue. The strength of the Snes’ diverse levels is appreciated by industry hero Dave Perry, who also was designer of the Mega Drive version of ‘Disney's Aladdin’. In a response to Mikami's preference for the Mega Drive game Perry offered his own diplomatic opinion. "I'm really biased as we made the original game and got Disney to deliver the animation," he said in an email to Polygon. "But I'd flip [Mikami’s] quote, 'If I didn't actually make the Genesis version I'd probably buy the SNES one.'" As with the previous game I got my copy of ‘Aladdin’ for my birthday as a gift from my wife. In a modern world, the game probably represents far better value for money than it did in the nineties. It’s shocking to think that at the time of the game’s original release shops were happy to charge over £50 for such a short experience. Edge said at the time that they “finished all seven levels in just one hour of intense playing – [which] roughly equates to a pound per minute.” Despite what boot fair traders would have you believe, not all retro games are worth more than they once were and £10 for a loose cartridge seems a far more palatable price (though of course an added box raises the price significantly) . Sometime though, it is great to have in your library a game which can be played from start to finish in a shorter amount of time. Though as a youngster I would no doubt have been laughed at when I tried to convince my friends that it was superior to the Mega Drive game (as looks counted for so much in those days), now when there are so many similar sword slashing action platformer its nice to have one that tries something different. Of course let us also be honest, when you try to write about a game a week for a blog, one that can be finished in your first sitting is always a good one to have.